Derby’s Lucy Ward made quite a mark on the folk scene with her 2011 debut, ‘Adelphi Has To Fly’ back in 2011. Bagging the Horizon Award for best newcomer at the 2012 Folk Awards clearly gave her the confidence and impetus which resulted in the marvellous ‘Single Flame’ to the extent that her third album is one of those deserving of the label ‘eagerly anticipated’. Mike Ainscoe gives it the once over. Not to put too fine a point on it, ‘Single Flame’ was a stunning album, showing a remarkable development in both songwriting and Lucy Ward’s confident and assured recorded performance. Atmospheric and haunting, it shifted from the lush and arguably commercial feel of ‘Velvet Sky’ to the apocalyptic ‘For The Dead Men’ and ‘Rites Of Man’ to dredging the depths of darkness in ‘The Consequence’ – Lucy emerging as the unthinkable heir to the Prince Of Darkness himself, Ozzy Osborne. Then there was the sublime delicacy of ‘Icarus’, all adding up to an album which was going to be one hell of an act to have to follow. However, the evidence is strong. 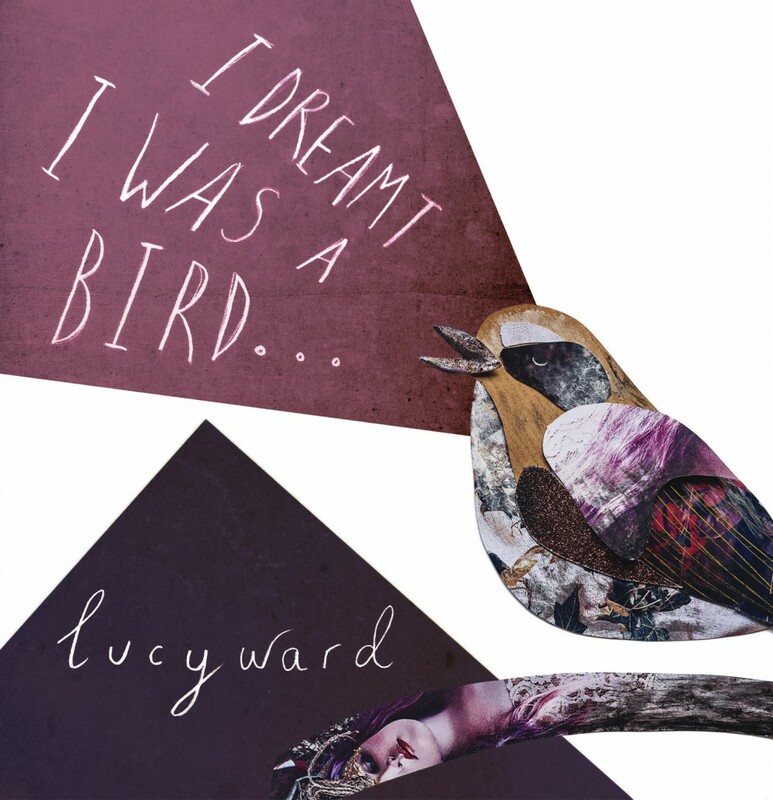 ‘I Dreamt I Was A Bird’ contains eight Lucy Ward compositions, a traditional song in her own inimitable style and one which features a collaboration with the Brighouse and Rastrick Brass Band. Some may raise their eyebrows at the unusual combo, yet anyone familiar with their work with The Unthanks or who saw the three songs they performed with Lucy at the 2014 English Folk Expo/Homegrown event in Bury, will be rubbing their hands with glee – just a pity she didn’t do ‘Cloud Factory’ which was perhaps the performance of last year’s event. The only non original song is a stab at the traditional ‘Lord Randall’, something which is always a treat. Having scanned the track listing, the credits also read impressively. Produced by Stu Hanna who also adds a considerable musical presence along with a band which includes Sam Pegg on bass, Stephen MacLachlan on drums, Anna Esslemont on fiddle and Lukas Drinkwater on double bass. And the opening track is an unqualified stunner. Leading in with the heavyweight lightness of ‘Summers That We Made’, just Lucy and Anna Esslemont’s strings convey a gorgeously bare sentiment, all reference to Autumn and reminiscing over the balmy Summer days of life. Impossible not to be touched. It also establishes the lyrical theme which runs through the album; the grounded urban and rural landscape, full of real people and moments in time, it sets its folk credentials, yet owes just as much to the musical diversity ranging from shades of psychedelia to protest folk punk and freeform jazzy overtones as well as big and bold arrangements. ‘Ode To Whittaker Brown ’ follows in the sort of arrangement Bella Hardy started to toy with on her last album, sort of jazzy free form folk. Inspired by Lucy’s mother, born in a Nissen hut after being made homeless in the Second World War, it’s the first of the family themed lyrics – don’t be misled by the opening “born in a stable your story foretold” lyric. It also confirms the subject matter has inspired the writing to be at times intensely personal and beautifully observed. The backing of the Brighouse & Rastrick Band on ‘Lion’ hovers like a dense and ominous spectral mist creeping over the song and not surprising that it evokes such an atmosphere considering the subject matter. Positioned slap band in the middle of the sequencing, it’s literally the centrepiece of the album; commissioned by Billy Bragg and performed on the Leftfield Stage at Glastonbury 2014, it’s the true story of Riflemen Robert Barker, a World War 1 soldier, executed (plainly “shot at dawn” in the lyric) in November 1916 for cowardice. In a word, chilling. In contrast, the gentle and dreamy ‘Song For Lola’ is like the mist clearing to reveal a warm Summer’s morning and the second of the family themed songs, followed up with ‘Daniel And The Mermaid’, another true story of her great great uncle who reportedly caught a mermaid off the Isle of Mull, drifting over on a shimmering otherworldly backing. As an artist who genuinely ‘performs’ her music, it’s the one song where Lucy really gets into the guts and inhabits the song; singing out the line from which the album takes its title, the “broad and mighty wings” phrase similarly swelling and soaring. Ending the album with ‘Return To Earth’, again it features Anna Esslemont’s fiddle again, twisting and merging with the Ward banjo and evoking a hypnotic and beguiling ethnic effect as Lucy Ward dips her toes into the world music pond. Like one of her peers Eliza Carthy, Lucy Ward is one of those larger than life personalities with an eye catching presence – blue hair must be back in – and while initial comparisons with ‘Single Flame’ might be inevitable, ‘I Dreamt I Was A Bird’ is soon flying by itself and establishing its own identity as another inspirational set of songs. Rooted in folk music it may be but ‘I Dreamt I Was A Bird’ transcends folk. Once again, it’s easy to say that this is another serious contender to add to the lengthening list for not just folk album of the year, but album of the year full stop. An indisputably genuine contender. Lucy Ward’s website is at : http://www.lucywardsings.com. She is also on Facebook and tweets as @LucyWardSings whilst her YouTube channel can be found here.